Trevor Story's home run. Credit: Isaiah J. Downing, USA Today Sports. The Colorado Rockies — led by Story’s three home runs — defeated the San Francisco Giants Wednesday night at Coors Field, 5-3. The win improved the Rockies’ record to 77-62 on the season. The Rockies answered quickly in the bottom half of the first inning. DJ LeMahieu started things by hitting a triple to right center field. Nolan Arenado then proceeded to hit a sacrifice fly that scored LeMahieu. Shortstop Trevor Story followed with the first of what would be three home runs for him on the evening. The first home run from Story established a 2-1 lead for Colorado and was a 459-foot blast that caused him to stumble in the batter’s box. The Giants managed to tie the game in the third inning. Evan Longoria hit a one-out triple to right field and then scored on a RBI single off the bat of Austin Slater. Tied at two, the Giants broke the deadlock in the fourth inning when Aramis Garcia blasted his second home run of the season to left-center field, putting the Giants on-top 3-2. Story quickly tied the game up in the bottom half of the fourth inning when he crushed a 1-1 fastball onto the concourse in left field for a towering 505-foot moonshot. The blast was the longest recorded in the statcast era, breaking the record set by Giancarlo Stanton in 2017. The home run was the third-longest blast in the history of Coors Field. The night was still young for Story, who went on to hit his third home run of the game in the sixth inning, another bomb to left field to push the Rockies ahead, 4-3. 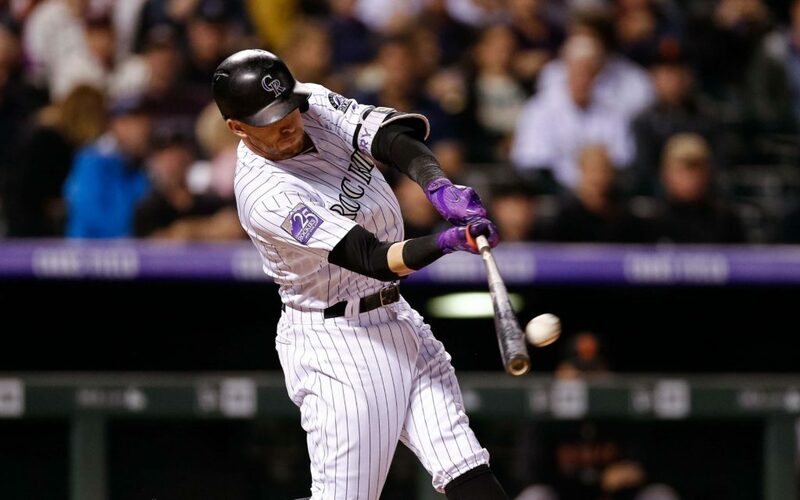 Wednesday marked the first three home-run game for Story in his career and it was the 17th time the occurrence had happened in Rockies history, the last being Nolan Arenado in July of last season. Carlos Gonzalez started the seventh inning with a double to deep right field which was followed by a walk being issued to catcher Chris Iannetta. Later in the inning LeMahieu drove home both runners by hitting an RBI single to right center field, extending the Rockies lead to 5-3. The Rockies would hold the lead, fueled by sharp performances out of the bullpen from Scott Oberg, Adam Ottavino, Harrison Musgrave, and Yency Almonte. Senzatela finished with a line of five innings pitched, allowing three runs on nine hits while striking out six batters. The Rockies are off Thursday before welcoming the Los Angeles Dodgers to town for a weekend series at Coors Field beginning Friday. The series will be crucial for the Rockies as they look to remain atop the National League West and make the postseason for consecutive seasons. Colorado currently leads the division by 1.5 games over the Arizona Diamondbacks.